Many family historians have a dream list of genealogy travel destinations. An inventory of trips they desire to check off their bucket list during their lifetime. Many of those trips include far off destinations of homelands and hometowns of their ancestors. Unfortunately, most family historians find themselves taking more conventional vacations than those on their bucket list, like trips to nearby archives and towns where their ancestors settled, generally those that are within a day’s drive.The ability to jump back a 100 years or more and cross the pond and walk the streets of your ancestral hometowns may just seem more that your pocketbook and schedule can manage. These days, it seems it’s the stuff reserved for celebrities on your favourite TV show. If you have a wish list that includes checking off those genealogy travel destinations, here are some tips to get you there. Of course, time is a valid concern, but you also must realize time will always be an issue. Many genealogists are really looking for the perfect time, and of course, that will never come. It really becomes about re-organizing your priorities. You may have to move things around so you can give your genealogy trips more precedence and scheduling it on the calendaar. 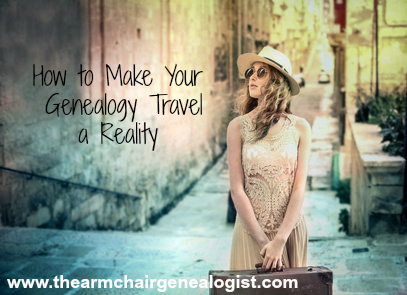 Instead of waiting for the right time, or trying to find the perfect time, look for a possible time when you can make your genealogy trips happen. for when you are poking around the Internet, reading or goofing off. During TV commercials, you can call up articles on your dream destinations. Start a Pinterest board for your genealogy destinations and use it as a vision board. Keep it front and centre so you can’t forget about those goals. Sharing your bucket list with friends, family or even a dedicated site like BucketList.org can help you to achieve your goals. As with many things, telling someone else you are going to do something often provides motivation to actually to do it. Humans are funny that way. A bucket list is often reflective of our idealization of a place or trip, and not necessarily what it is like to go there. When you share your list with others who may already have been there you can get a sense of what a place is really like and whether it should be as high on your list. We often romanitize our ancestor’s hometowns, however, by connecting with others who have been there you may get a reality check. Putting your network of friends and family on the task of making your trip a reality offers you a supportive team who can bring any number of ideas to the table when planning your trip. Once you get a sense of where you might go and more or less when you might pull it off, you will want to narrow down your choices to the trips you most want to take. Unless one destination rates well above and beyond the others, I recommend starting to research two or three of your top choices. Trying to plan for 10 very different potential bucket list options is unreasonable, and picking only one could set you up for disappointment if the logistics turn out to be forbidding. Making a list of your genealogy destinations also helps you to rank them in order of importance. Some items on the list might not seem as interesting after you have looked at them several times, and could fall off the list in favor of other ideas. While you're at it, you might also write down the reasons you want to go to each destination. This exercise might help you to weigh your destinations against each other. Are you looking to do local genealogy research? Is it to get upclose and personal and have that time-travel experience? Are you writing a book? Do you want to meet with distant relatives? There may be some pressing issues and deadlines that might help you to narrow down your list. Once you narrow it down to your top 2 or 3, focus first on practical things like what time of year you can get off work versus the best time of year to go there. How much time it takes really to do the destination justice and how much money you will need to pull it off. This is easier said then done and it is probably the most personal of issues, as everyone's financial means and demands are different and complex. But putting a few plans in place to start saving is a key element to making your plans a reality. The money isn’t going to magically appear and often there is little left at the end of the week to set aside for trips. However, there are a number of great tips to help you save for those highly-sought after genealogy trips if you are motivated. Join us next Tuesday when we give you a list of money saving tips for that next genealogy dream vacation. Here’s a hint, it won’t include the overly-advised advice of skipping your favourite takeout coffee because I know that's just not practical advice for this genealogy crowd.